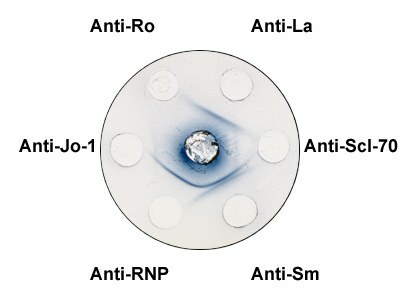 Rabbit Thymus Extract forms precipitins with autoantibodies that bind Sm, nRNP, La/SS-B, Scl-70, and Jo-1 when tested by immunodiffusion. Add 0.5 ml cold distilled water to lyophilized powder (Some assay systems may require more concentrated or more diluted extract.) Some precipitate may form but will not affect the performance of the product. Repeated thawing will result in loss of activity. After reconstituting, aliquot and store frozen at 20°C.